I’ve been thinking about my legs a lot recently, and particularly since my recent interview with Atlas in which he described the huge impact he noticed from learning how to bring ease to his legs. Maybe I’m also a little obsessed about these 2 important parts of me because I do a lot of walking and a lot of swimming. And of course because I’m a teacher of the Alexander Technique and naturally interested in physical functioning in general. What are are my legs doing, and how well are they doing it? That’s the kind of question I find myself asking these days. On a recent walk, it occurred to me that my legs were actually performing two somewhat distinct functions: They support the rest of me – my torso, arms and head – and they move me through space. Support and move. Both these functions require a certain amount of strength but moving requires a great deal more flexibility. And there are plenty of ways in which one or both of the functions can become compromised over time. Often it’s harmful patterns of sitting, standing, and moving we’ve learned over the years that cause this. And if we’ve learned how to create the problem, we can also learn how to restore efficient functioning. That’s exactly what the Alexander Technique is all about. So how can the Alexander Technique help you to improve the quality of your leg use? The obvious answer is that the Technique has a very long history of improving overall coordination, movement and balance. And since your legs are an important component of that, their function will naturally be enhanced. Perhaps best known, Alexander Technique “table work”, during which the student is lying in the Constructive Rest position, is a perfect framework for focusing on a students legs, and how they function. It’s relatively easy to help a student release tension in a leg when it can be lifted off the table and and, in a sense “disconnected” from the rest of the student’s body. A skilled teacher can then help the student take that release into the real world of standing, walking etc. A somewhat analogous process was developed by he late Walter Carrington, a well-known teacher and trainer of teachers Alexander Technique teachers. He pioneered the use of “saddle work” – having the student sit in a horse saddle mounted on a wooden frame, with their legs hanging freely to the sides of the saddle. This position makes it possible to help the student release leg tension more easily in a sitting position. Marjorie Barstow was another prominent teacher whose approach to leg functioning took the form of asking students to think of their legs “tagging along”, as she put it, when walking. The idea was to get them to let go of “placing” their feet on the ground in a habitual manner, allowing their legs to move in an unfamiliar, easier, manner. Marj also developed a simple way of using her hands to guide students’ legs for a few steps in order to give them the direct experience of letting go of unnecessary leg tension. In my own Up With GravitySM work, I’ll often ask a student to use simple imagery to move their center of gravity – instead of “walk” – around the room, for example. They will typically notice that they are now moving with greater ease and the most obvious manifestation of that change is usually felt in their legs, and the way their feet arrive at the floor. As with Marj’s approach, it’s a way to release unconscious patterns of leg movement that interfere with ease of movement. Body Mapping, an Alexander Technique development by Bill and Barbara Conable, can be a quick and effective way to help bring your legs’ functioning into line with your actual physical structure. For example most people have a misconception of where their hip joints actually are and correcting this error can change the way you use your legs immediately. Their book, How to Learn the Alexander Technique – A Manual for Students, provides detailed information about Body Mapping, and how to use it to improve your functioning. With the development of Freedom Directions, some teachers will ask their students to think “My legs are free” or subsidiary directions like “My feet are free”, “My ankles are free” etc. which can be very effective at addressing leg functioning. How about Alexander himself – what suggestions for improved leg functioning did he put forward? It is not possible…to set out in written language the correct pose of the feet and legs in the ideal standing position, and I therefore subjoin four photographs which have been specially taken for this purpose…and which show quite clearly not only the correct position of the feet, the fundamental problem, but also how the whole body of the person is thereby thrown into gear. A (image on left)—The feet are here placed in the ideal position for obtaining perfect equilibrium of the human machine, and for permitting the maximum activity of the functioning of the whole organism. 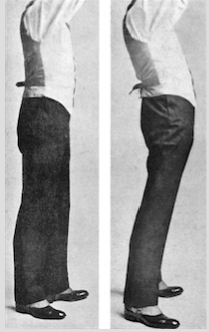 B (image on right) —The feet are here placed in a position which compels an imperfect adjustment of the whole organism in order to secure even an imperfect equilibrium. This position results in the minimum activity of the vital functioning. That idea of correct standing promoted by Alexander was similar to one of the nine ‘base attitudes’ that the Delsarte Method students were told to practice in front of a mirror. Alexander was, it must be remembered, a teacher of that method well into the 1900s. But when this ideal position is realized, the task of obtaining it by each individual has still to be undertaken. And this turns out, in his view, to be a good deal more complex and likely requires the help of a trained teacher. And if you’ve had Alexander Technique lessons and noticed changes in your feet and legs – or if you’re an Alexander Technique teacher or student who has come up with a way of using the Technique to specifically help with leg functioning, please comment below and on Facebook.